Our MLS members can show at the top of each one of their listings, with their name, picture and phone number, making it easy for potential buyers to make contact. To appear at the top of your listings on Trulia, simply make a free account on Trulia and be sure to use the same email address on the MLS that is used on your Trulia profile. This will automatically connect agent's listings to their listing on Trulia. † Zillow Group has its own display policy and feed practices. 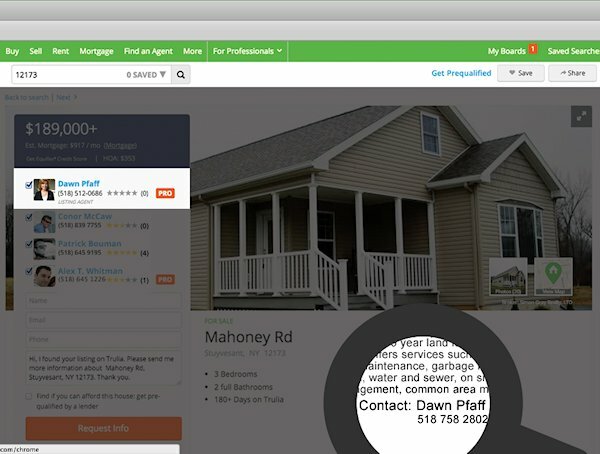 Not all listings will appear on Zillow.com, Trulia.com, RealEstate.com and other Zillow Group sites as Zillow Group limits listings by property type, prohibits commercial listings and does not take duplicate listings. Zillow also limits the listing source on a few zip codes in New York City, where they require some listings in certain zip codes to come from their sister site, StreetEasy. The member's firm must participate.